Luxury treehouse retreat in the Sunshine Coast Hinterland, nestled between beautiful rainforest & Lake Baroon. Lakeside views & rainforest surrounds make Secrets the ultimate romantic getaway. A truly unique place like no where else in the world. Getaways, honeymoons, anniversaries or just because! Amazing food and service with breathtaking views of the lake. The perfect location for your dream wedding. Great packages available. My partner and I recently stayed at Secrets on the Lake in the Lizards Lair treehouse. We were absolutely blown away by the beauty of the grounds, the view from our treehouse and the craftsmanship of the entire place! This family run business has added a wholesome thoughtful touch when creating this haven. We arrived to beautiful scones with jam and cream, a cheese platter and a breakfast basket that was brimming with options. We added a food package and had a two course meal the first night, and the BBQ pack the second night. The food was incredible! There was not one thing we ate that wasn’t delicious! We chose croissants each morning which were delivered warm to our door (I was too slow eating mine and a cheeky kookaburra stole it from my plate!) Highly recommend getting the picnic lunch option and eating it by the wooden swing on the lake! All of the above was incredible, but what really set it a part from other places we’ve stayed is George (and family). George made us feel so welcome, he had us laughing within minutes and was always up for some friendly banter. If you want to sweep your partner off their feet, or reignite the flame, definitely stay at Secrets! 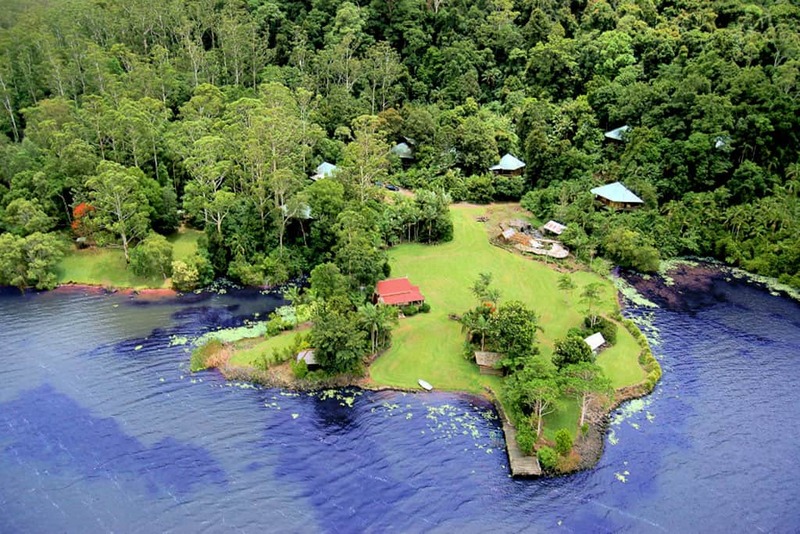 Secrets on the Lake near Montville Queensland is so special it is hard to put into words. Every Treehouse is themed and individually styled with beautiful red cedar carved into tables, seats, cupboards, benches, cabinets and decorative carvings for useful items like toilet roll holders. Everything was so private and done with excellence from the spa baths in each unit overlooking Baroon Dam to the croissants or muffins delivered each morning hot and fresh. Even the walkway railings leading to the cabins all had carvings of small critters giving reason to smile and just enjoy. I don't think I have ever enjoyed 2 days before as much as these. We came away refreshed even though we had a thunder storm on our second day that looked amazing but kept us house bound. That wasn't a problem because food in our package was so plentiful and so good we had no need to go anywhere. Put this one on your bucket-list. What an amazingly beautiful place, and the amount of (wood)work that has gone into this place blows my mind - truly a labour of love. Delicious meals from very friendly staff. Just had lunch but will definitely be back to stay. Thanks to our hosts. Loved it! One of the most beautiful places I have stayed. The rainforest setting is magical and so peaceful and the cabins feel like they are carved from the rainforest itself. Nothing was overlooked, from the breakfast basket on arrival to the spa and the gorgeous fireplace with daily wood and kindling. The delicious hot croissants delivered every morning, candles throughout your room and the incredible staff that were so helpful and friendly. I never wanted to leave! True heaven on earth. I will definitely be back! Love, love, love it - my hubby and I felt like we were the only two people in the world hiding away in our beautiful and very private tree house (Secrets). View amazing and staff wonderful, friendly and accommodating. The restaurant was great as well - will definitely be back. My wife and I stayed at the Dragonfly cabin last weekend. It was for us the best experience we've ever had. Not only the cabin but the entire site is breathtaking. So much details everywhere you go. The wood and metal work could not stop to impress me at every turn. This would be my #1 recommendation for anyone I know. I am already thinking about going back. I've only got one regret and it's to have forgotten my camera at home! Thanks to George, Aldy and all the crew. EVERYONE was super nice. A very well kept secret! One of the most beautiful and serene places we have ever stayed. The Tree Houses take your breath away, so unique and very private. We have stayed here twice, first time in ‘Dragonfly’, just beautiful and recently in ‘Secrets’, the ultimate Tree House with amazing views across Lake Baroon. We didn’t want to leave! The gardens are spectacular and an absolute credit to George and Aldy. What an incredible vision you had twenty odd years ago. Thank you for making our stay so perfect in every way. Amazing place to stay. Service fantastic & the food is amazing; staff very obliging. Private & relaxing. Attention to detail in the Cabins; loved the wood work in our cabin (Possums). Very romantic for couples. Brilliant place a must see with gorgeous views over Baroon Pocket Dam hidden amongst a treehouse setting amazing food great staff and accommodation available. Beautiful wood carvings and gifts local art and produce available for purchase. This is a must see if you are visiting the Sunshine Coast Hinterland any time of year. Meal prices are very reasonable and the food is of an excellent quality the view is to die for. This is truly an exceptional place. As soon as you turn down the road leading to it, you can tell this is something special. Staff greeted us on arrival as though we were the most important people there. The welcome food and arrival basket is nothing like the often tacky 'arrival drink' at many other hotels, is was such a special and luxurious touch. We were personally shown our room and all we needed to know about it. Staff were there at all times if we needed, but never intruded. Made us feel we were completely off the grid. The photos online do not capture the thought and detail put into every single part of it. We had the most amazing stay here - and cannot want to come back. from anywhere else in the world! Featured on national television as ‘the perfect romantic escape’ and in the international book ‘1001 Things to do Before You Die’.